Any known *non-technical climbing* routes from the crazies? Edited 1 time(s). Last edit at 08/16/2011 09:37PM by Ohnivy-Drak. 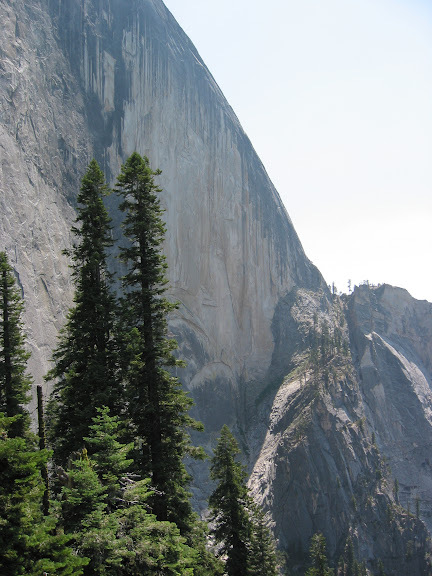 You go up the Half Dome Slabs to NW face .. and it's all more or less class 3-ish. Ahwiyah and Bushido Gully from what I have heard are class 3.
much to doooooo out there!!!!!!!!! not gonna do 1/2 of what I had planned this yr.
As ordered: Yeah, I've poked around up there. Never been actually on top of the thing. Tough brushy ledges and probably class four, but the real problem is that there is no need to go there. The rounded top means that you can't see the fabulous sheer cliff below you. The view from there of the face of Half Dome is good, but the view from the wooded ridge above it is just as good. The view of Tenaya Canyon is no better than from Quarter Domes and the Diving Board. 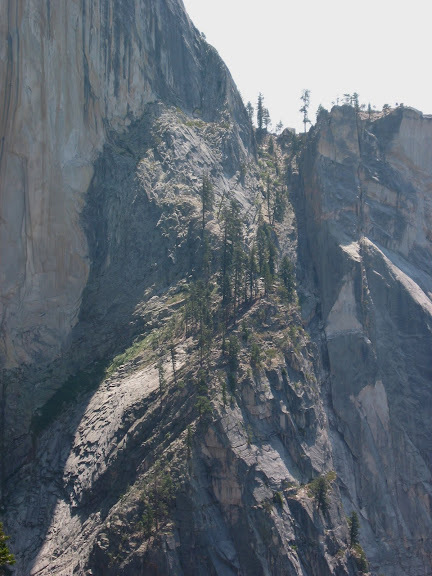 If you still want to go over there, I would recommend the following: Take the Half Dome trail to the start of the steps on the subdome, then follow the climbers trail down to the bottom of the face. From there, go over to the grove above Ahwiyah Point and go out as far you you want for views, then come back and follow the big ledge at the base of the face as far as it goes. Get your pics and return home. Or continue up the class four route to the Diving Board, but remember that it takes longer than you might think. At the end of the face ledge, you have to bushwhack down a couple of hundred feet to get to the western end of the face, and it is a long, exposed scramble up to the Diving Board. I would never do it without a rope. Also be warned that the gully that you are ascending (Which I hear that the whippersnappers call Bushido...Roper never called it that!) is famous for holding ice well into summer. According to a climbers forum on supertopo.com, there's a zig-zag route up the NE Gully which the author considered Class 3. Looks dangerous in any season. I was just curious if anyone has been to the top. I've never seen a photo of anyone up there. I also thought about your suggested route, going around and down from Subdome. Not that I would ever attempt it, but maybe it's for "Chicks" and "Burds"
[According to a climbers forum on supertopo.com, there's a zig-zag route up the NE Gully which the author considered Class 3. Looks dangerous in any season. I was just curious if anyone has been to the top. I've never seen a photo of anyone up there. Oh, yes. Roper mentions a number of "class 3" routes up it. However, I've found that many of his class 3 routes are my class 4. The only good thing about the Point is that you won't fall far before you are hung up in bushes. I mentioned the tree grove above the Point. Here is a photo. 1 is the Diving Board, as seen from near Glacier Point. 2 is the nearer Quarter Dome. 3 is the climbers ledge below the face. The grove is just to the left of the climbers ledge. The Point is down off the photo, to the left. I'm guessing we have different ideas of easy. Right. In this case, my daughter and I roped the whole thing. More than 20 pitches, to the amazement and laughter of the guys up on the face. When we were on the correct route, there wasn't a single step that was in any way difficult. But we were terrified that we would get off-route. Roper's guide calls it class 3, and says that you can do the whole thing in 15 minutes! Bah! Humbug! Wow. This route to the DB is out of my league. From which way did you get back down? Via the usual Lost Lake route? By any chance has anyone gone up to the Diving Board via the Le Conte Gully route from Happy Isle? Supposedly that was the route that Ansel Adams took when he went up there to shoot his famous photo, "The Monolith". Edited 1 time(s). Last edit at 08/18/2011 05:48PM by plawrence. Nevertheless, next time I'm on the Sierra Point trail, and have some time, I want to explore some of the gullies to see where they go. and more at both sites. Yeah, well you've got me remembering it now. The 20 pitches was an exaggeration....because that includes about five in the dark going down the other side. Those pitches were very short, because we had only one working flashlight, so I couldn't go more than about ten or twenty feet. It was a family epic. The sort you could never have otherwise, because you would never find a hiking companion that incompetent. My daughter had come home from her first year at college in PA, all happy because she had learned climbing from the outing club that I used to be president of. I thought it would be fun to dig out the old climbing equipment, except for a new rope and a couple of new slings, and do some easy class four. The route across the face and up to the Diving Board seemed perfect, since Roper said it was class 3. I even bought a new climbing harness, since the ones we used in the early 60s were all home made. Women were involved, so we got a late start, and then we had to wait out some drizzle for couple of hours in the grove at the north end of the face. So it was well into afternoon when we set out again. The climbers ledge ends halfway across the face, and the brush that you have to swim down from there was soaking wet. We started the actual climb, and I discovered a horrible fact: She had learned to climb and belay and rappel, but had never seen a belay position being set up, nor had she any concept of rope management. Have you ever seen one of those cartoons with a person wrapped up like a silk cocoon? It was like that every time she belayed me. Somehow she put dozens of twists into the rope every time she touched it. We turned the corner from the first gully too high, and had to screw around looking for the easy traverse to the gully that actually leads to the Diving Board. Which we reached at dusk. It was then that I discovered that she had forgotten her light, and I had only one that worked. I knew that my wife was going to call the rangers if we didn't show up by breakfast (this was before cell phones and FRS radios), so we spent much of the night in a dwindling bubble of light (this was before LED lights that would last all night) down climbing the access route to the Snake Dike and then we got lost in the bushes at Lost Lake. However, we did get down it time to prevent any rescue attempts. I now know much easier ways off the Diving Board. I keep much better spare lights in my pack. The climbing was actually very easy, and I now know the route. I could do it again any time without incident. But why spoil such a memorable trip, by showing how it should be done? Soon enough my daughter's daughter will be ready for a few epics with her geezer gramp. ANYTHING requiring ropes is not easy. Especially since I have no climbing training! A nice report from one of the crazies. I'm afraid that Bob Burd has been spending too much time on the National Geographic website. In the last paragraph of his trip report that you linked above, he refers to the river below Half Dome as the Tuolumne River. Edited 2 time(s). Last edit at 09/25/2011 09:21PM by plawrence. This and Roper's later versions are the bibles for scrambles and obscure stuff. Thanks for the link to that 1940 Guide. the route is clear where it breaks off from sierra point, deffinetly has gotten use in the last few years but I dont know what the difficulty is. Are you saying you went up LeConte? And it was easy? Or what? I've been part way up LeConte gully and it starts off pretty easy. From there it looked passable though fairly crumbly. What stopped us was water. Early in the season, April, May, there is still snow in the upper gully, snowmelt seeping down, it got too wet and slippery. Now would be a good time of year to try it. If you aren't travelling solo, the biggest issue might be trying not to drop junk on your partner. And if you ever kick a rock off, always yell "ROCK" since there might be someone else below you. Last time I took some pals up to Sierra Point, we got bombarded. I was just curious if ryan went up it. His statement is confusing to my chick-on brain. And if so, did go up Grizzly Peak? And which way down? plenty o shrub to contend with. Anywho, awesome photo of Grizzly Peak. Love love love it. I'm not sure of the points you reference, but when you get there, the turn is pretty obvious. You wiggle up all the garbage until you hit the wall and the trail to Sierra Point takes a hard right. You go hard left to LeConte and can follow a faint use trail for a while. One other trick, at the base of the route to SP: after you turn off the freeway and clamber through the initial rockpile, head to the right as soon as possible. Get off the big blocks as soon as you can, maybe thirty yards or so. The use trail begins there, way down low. I always see some knuckleheads spending hours wading up through that talus and say see you later, pals. I climed up that talus on my way up the first time! There seem to be three "bases" for the route to Sierra Point: the "Rock Piles" sign, the "Bear Encounters" sign and spring, and the place a bit further up where the Vernal trail crosses the bottom of the rocky gully (LeConte?). I believe the original trail started near the "Bear Encounters" sign and headed generally up and left after a few short switchbacks (there is some rockwork here). This area is quite overgrown, so it's easier to start from "Rock Piles" nowadays. The cable that used to be installed where the SP trail crosses the rocky gully (LeConte? )and climbs a bit of steep, open rock up and to the left can be found in the gully below the trail--at least, it was there a few years ago. The rocky gully to which you refer is not LeConte. LeConte gully angles up to the left of Grizzly Peak in my photo above.